The Blanton Museum of Art at the University of Texas at Austin presents Xu Bing: Book from the Sky, a monumental installation by celebrated Chinese artist Xu Bing. Regarded as one of the masterpieces of twentieth-century Chinese art, Book from the Sky ushered in the avant-garde movement in post-Mao era China. It also won Xu Bing international recognition, including the prestigious MacArthur Foundation “Genius” Award. Since its completion in the early 1990s, this profound meditation on the nature of language has been exhibited globally, a testimony to its provocative power and ability to engage viewers beyond its original context. 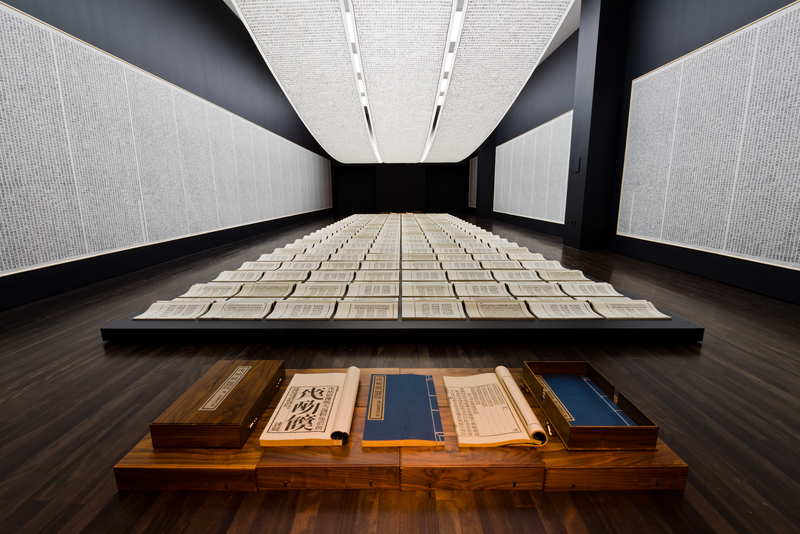 Xu Bing, “Book from the Sky,” ca. 1987–91. Installation of books and scrolls printed from carved wood types of invented characters, ink on paper, dimensions variable. Installation view at Blanton Museum of Art, The University of Texas at Austin, 2016. Courtesy of Xu Bing Studio. Book from the Sky at the Blanton will offer a rare opportunity to view the iconic work in its full, intended scale for the first time in Texas. The installation will transform 1,500 square feet of the museum’s galleries into an immersive temple-like space filled with printed text. 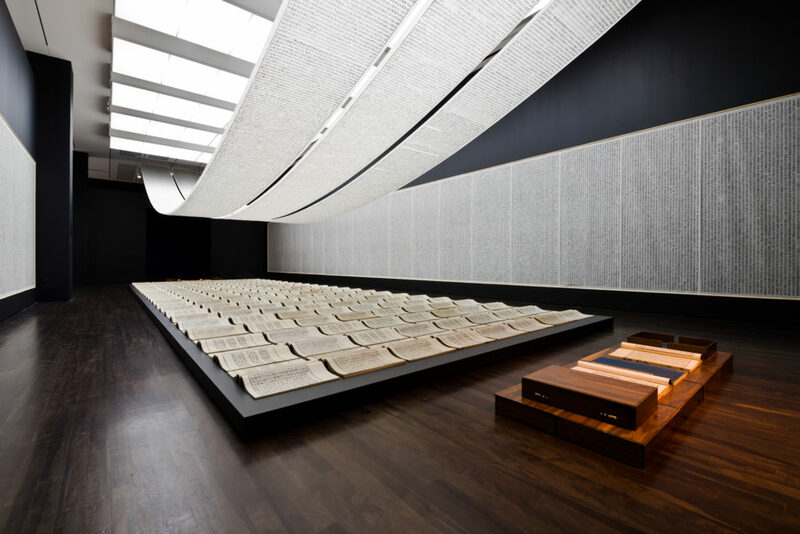 Displayed in the form of books, hanging scrolls, and wall panels, the enveloping words invite reading and appear to promise meaning, yet these texts cannot be read—not even by Xu himself—as they are composed of some 4,000 pseudo-Chinese characters invented by the artist. Each character appears plausible, when in fact it carries no meaning, rendering all readers illiterate. Xu Bing (b. 1955) grew up in Beijing during the Cultural Revolution (1966–1976). He studied printmaking at the Central Academy of Fine Arts, where he earned his master of fine arts in 1987. Book from the Sky was among his first independent works. Over several years in the late 1980s, he invented 4,000 pseudo-characters and carved them into wooden printing blocks, from which book-length texts were composed and hand-printed. Book from the Sky garnered immediate praise but also aroused deep suspicion; the latter characterized its official reception in China under the unsympathetic climate following the suppression of the 1989 democratic student movement. Xu came to the US in 1990 as a visiting artist and eventually established a studio in Brooklyn, NY. Eighteen years later in 2008, Xu returned to Beijing where he now serves as the vice president at his alma mater. Book from Sky has yet to be shown again in China. At its core, Book from the Sky is a contradiction—its text cannot be read, rendering the book meaningless. Such absurdity invites reflection. Book from the Sky has been interpreted by some as a reaction to the propaganda of Xu’s youth in Maoist China, where language was manipulated and abused by those in power. More broadly, it may offer insights into Chinese identity, which has long been defined by the culture’s sacred books, from Confucius’s Analects to Mao Zedong’s Little Red Book. Yet Book from the Sky is relevant far beyond its Chinese context. In its first full-scale installation in Texas, Xu Bing’s subversion of language calls into examination our faith in the written word and the authority of a book. By disengaging meaningful content from the written form, the artist exposes inherent ways in which language can be both vulnerable and culpable. The Blanton’s presentation of Xu Bing’s Book from the Sky is guest curated by Hao Sheng, formerly the Wu Tung curator of Chinese art at the Museum of Fine Arts, Boston. Generous funding for this exhibition is provided by the E. Rhodes and Leona B. Carpenter Foundation, with additional support provided by The Freeman Foundation, the Robert Lehman Foundation, and donors who contributed to the 2014 Annual Fund.